Add video, fonts, clipcart, widget for making it alive! LCD/LED TV 32" or more with an HDMI input and USB support. Ready WIFI network with internet access enabled. A compatible Android and Windows PC with latest Google Chrome. After you have registered yourself on Adsignage.in using your Google Account. Login with your Google Account and create first player account with its orientation and PlayerKey. 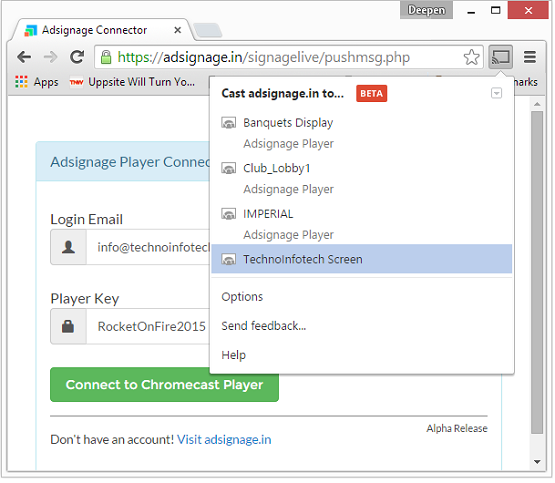 Latter you would need to connect using Player Connector link to establish the connection bridge for publishing & casting your planned content to Google Chromecast. We offer you media storage for your images on our server for your content to use for special purposes. 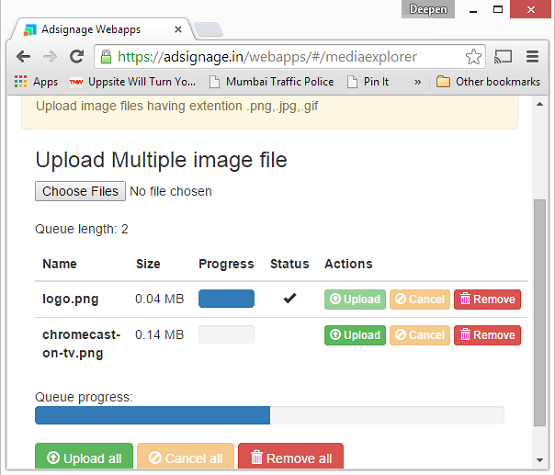 We also support multiple upload of images. You can upload your logo, backgrounds, event images or your people images for special surprises!!!. 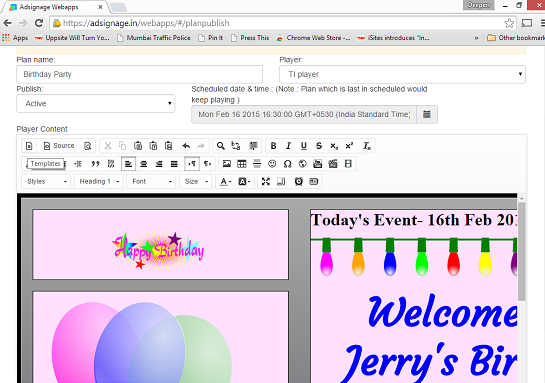 Templates, which offers you different layout for Normal or Vertical view; which help you build your idea faster. Text styling like bold, aligining & Colors for text and its background and with support for undo and redo. Tables for planning content positioning or creating Menus. Smileys & Pasting of content from various sources. Working with raw content code for fine tune editing & touch-ups, as if you edit a website HTML page. Image library having not only your media but also openclipart SVG vector images for you to use in your layout for events like wedding, birthday and more. Support for Youtube integration with autoplay & loop. Also you can add HTML5 Video Tags, which streams your local web-server or HTTP Media Sharing Video contents. Support for free website widgets for RSS from feed.mikle.com for adding RSS news feed or Quote feeds. or say exchage currencies information from exchangeratewidget.com. or adding a Embeded code or IFrame code to display news content from your University or your company websites. Ready to kickstart your business with AdSignage? We at TechnoInfotech deliver products and solutions that enable organisation make best utilisaiton of opensource software for business communication, internet access and systems management. New to AdSignage? Sign up now.